← bring on the pink fuzzi bunz! 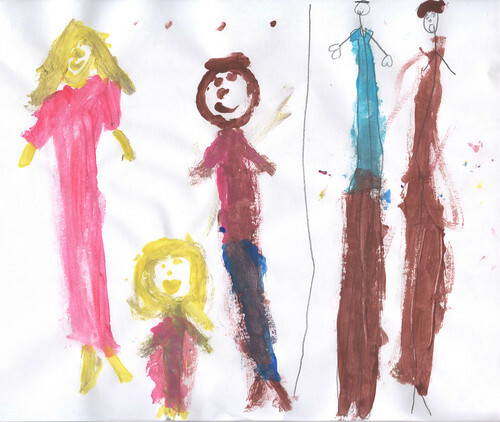 Here is the previously mentioned family portrait that Mags painted immediately upon returning home from the ultrasound. From the left, we have Maggie, Baby Girl Higgins, Calvin, a line that apparently represents the child / parent divide, skh and it ends with me on the far right. Here are a few observations I have. We are all insanely tall and thin. Well, except for Baby Girl, I guess. Sean and I have very small heads compared to our children. Our Baby Girl has shoulder length blonde hair. Calvin, our white haired child, is sporting a brunette look here. The last thing that I noticed, and it’s what I love the most about the painting, is that skh’s hands are shaped like hearts. I’m guessing it wasn’t intentional, but I love the representation of his love for our family through his hands. Maggie, did a wonderful job!! We all want to be just like you guys!! God has blessed your home with another precious baby for our church family to love! Helen, you want to be just like us…with tiny little heads? Yay for new babies! I can’t wait!!! Love you all and am rejoicing with you over baby girl! Joan, I need to post some of Maggie’s more accomplished pieces as well so that your reputation will not be tarnished. We love you! this is tara miller. congratulations on baby #3.
i am interested in cloth diapers and wondering how you decided on fuzzi bunnies. Bumgenius gets best reviews, but i’d like to buy used from you if i can. i couldn’t email you from your diaper site because my outlook is out of order right now. do you use the all in ones, all the time? i also have 3 and 5 year old bed wetters and wondered if you’d heard how these work for them? i think they’d need the large or extra large. 33# and 46#. Praying for your awful morning sickness. This is fantastic! I wish I could draw so well. I think I’ll stick to… whatever I can do better, which isn’t coming to mind right now. I’m so excited for your baby girl! i love the drawing maggie! how fun for maggie to have a baby sister! congrats to you sean, mo, maggie & calvin! how exciting! Did Maggie say that they were hearts on Sean’s hands? I thought that they were baseball gloves!! I think you both look like the painting “The Scream.” I don’t know what that means – that Maggie is a modernist? Let us hope not!